The overall graph is the following. Reading the graph, it appears that it was after the Fed tapered and ceased quantitative easing that the economy started slowing down. We may remember Mr George Soros said in Davos in January that whereas negative interest rates are not effective, quantitative easing elevated the economy. Whether you have -20 basis points or 30 basis points, it’s not going to stimulate the economy. The quantitative easing has worked. It has saved the world from deflation and great depression. That’s the lesson we have learnt from 1930s. However, the QE has finished, and thus the growth is also finished. That is the chronic disease of the global economies. Although most of the elements of the GDP slowed down, personal consumption grew 2.70%, accelerating from 2.37% in the previous quarter. The interpretation of this strong figure is the main issue with the data this time. As economic figures must be reviewed in the relation with other figures, we first look into the other elements. The worst figure this time was fixed investment, which grew only 0.31%, compared to 2.18% in the previous quarter. The business-related figures such as structures and equipment are especially slowing down. It has been said that the slowdown of investment is due to the low oil price, but even after the oil price rebounded, the investment has not recovered. However, as the slowdown of investment is quite radical already, it does not seem that the cause is only in the energy sector. 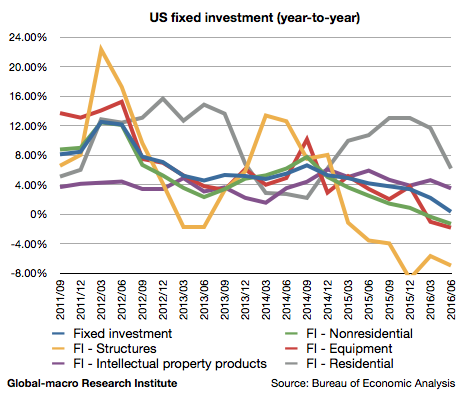 Our hypothesis is that it could be the rising labour cost that is preventing investment in the US. 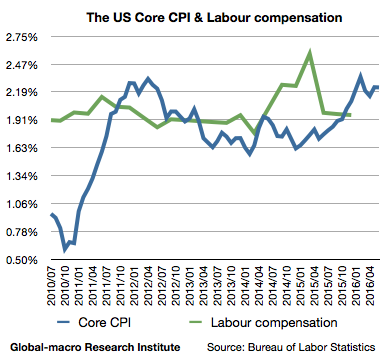 The labour compensation has been growing 2%, followed also by core CPI at a similar level. 2% is not necessarily too strong, although it could be high enough to prevent companies from hiring workers considering the weak growth all over the world. 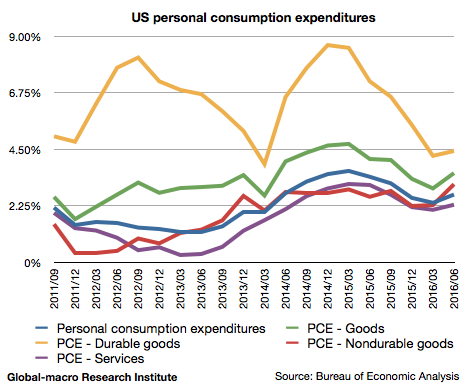 This also explains why consumption is enjoying a growth. Workers and companies are struggling against each other for the same pie, and so far workers are winning under the situation of the very low unemployment rate in the US. Lastly, we review trades. Exports grew -1.23%, even diminishing from -0.88% in the last quarter, and imports slowed down to 0.19% from 1.00% in the last quarter. 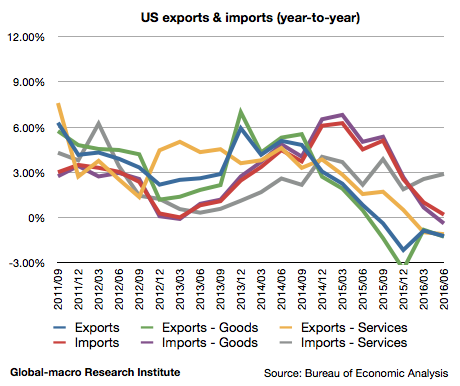 The reasons why both of imports and exports are slowing down should be discussed separately. The timing when exports started to slow down is when the dollar started to strengthen, implying the strong currency has been putting the pressure on the exporters. The essential cause of this issue is the slowdown of the global economies, which forces countries into the currency war. The slowdown of imports, on the other hand, should be explained when we focus on the relatively good figure of the imports of services. 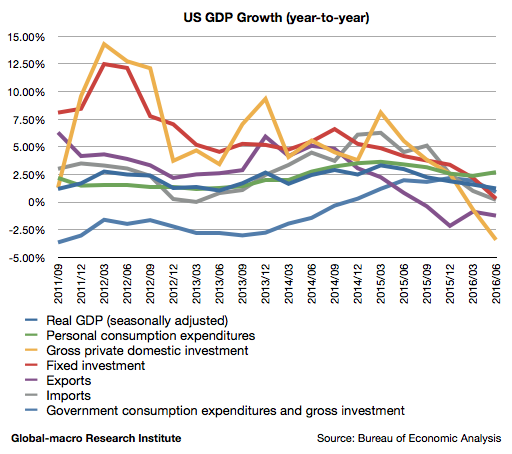 It is that the slowdown of the imports of goods reflect the slowdown of companies’ investment, and the still-growing imports of services reflect growing personal consumption. To add more explanation for the growth of personal consumption, it may help to consider the long-term interest rates that have been declining this year. The low rates are helping those who have loans for credit cards and mortgages. On the other hand, companies are not reacting in the same way although the low rates should also help them. These two facts would give investors a significant implication: when the Fed restarts the QE, it could work on personal consumption but not on investment. Since the prospect of the Fed’s restarting the QE appears almost inevitable at the moment, the investors’ next preoccupation is whether or not the QE works again on the US economy. The GDP data this time is only one of the factors that show the prospect, and we will keep looking at the upcoming data to conclude. Why is the global economy so vulnerable? Hedge fund managers will be happy to explain for you.